Writing a thesis is simultaneously the best and most terrible thing I have ever done. Anyway. Nietzsche! Has there ever been a philosopher with a cooler mustache? I think not. Other things Nietzsche had: Syphilis. But that’s not to say we should write him off. He grew up next door to a church–his father was a Lutheran pastor (who died when young Friedrich was four). That he later went on to propose some revolutionary ideas about man’s relationship to religion in the 19th and 20th centuries is not entirely surprising. He lived a quiet life in the mountains, because of health issues, and so he knew what he was talking about when he said that happiness comes from overcoming obstacles. That’s an older idea than him, actually; I believe it goes back to Aristotle. At any rate, Nietzsche is quite cagey and doesn’t say what he thinks the new morals he’s calling for should be like. He is pretty clear that he thinks hanging on to Christian morality is stupid and outdated. You can check out the famous passage on the death of God from The Gay Science here. (He talks about the death of God again in Thus Spoke Zarathustra.) He has a marvelous mode of writing, it’s very readable. What else? Philosophy Now magazine did a marvelous podcast about our fellow that you can listen to here. And philosopher Alain de Botton did a 24-minute episode of a longer series for the BBC about Nietzsche, and you can check that out here. It’s awesome both because the US would never air something like that (not enough desperate housewives) and because de Botton is very good at explaining the essence of Nietzsche’s philosophy. Is that enough links? Can you tell I’ve been doing some research? I’m having an affair with Nietzsche; don’t tell M. Foucault, I fear he would sulk. I wrote an article on running for a local running blog called Technically Running. You can read it here if you’re interested. 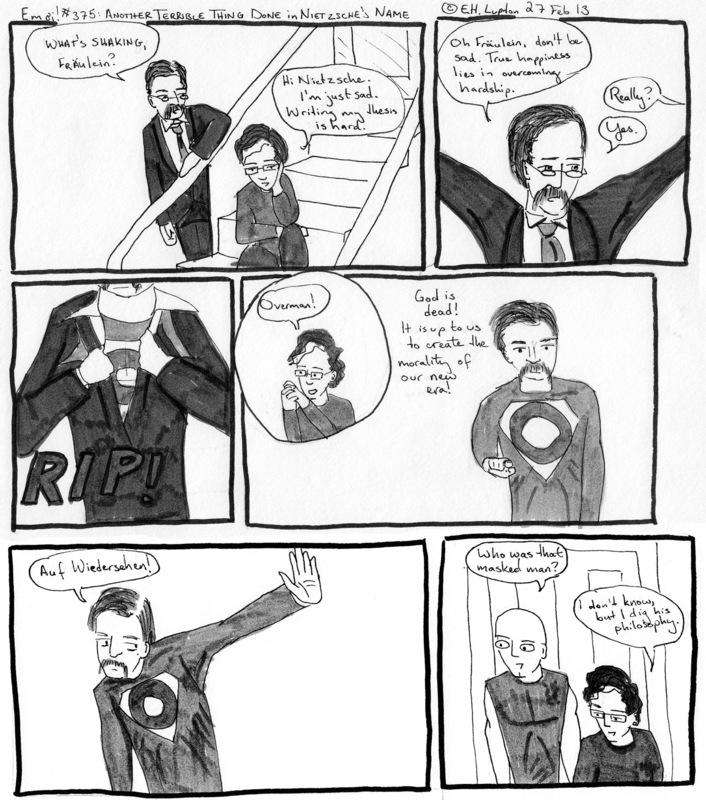 You can check out the last comic I did with Nietzsche in it here. This comic will be filed under B3317.L86 2013, for Philosophy (General)—Modern (1450/1600- )—By region or country—Germany. Austria (German)—By period—Later 19th and 20th centuries—Individual philosophers—Nietzsche, Friedrich Wilhelm, 1844-1900—Criticism and interpretation. What’s this one filed under? Oooh, good catch! This should be B3317.L86 2013, for Philosophy (General)—Modern (1450/1600- )—By region or country—Germany. Austria (German)—By period—Later 19th and 20th centuries—Individual philosophers—Nietzsche, Friedrich Wilhelm, 1844-1900—Criticism and interpretation. I’ll update the post.